MCA 2270. The Vassar Clements Band. 1977 LP. Includes Mixed Melody, Lillie Dale, 2am, That Old Black Magic, Jessica. Band members are Vassar Clements, Doug Jernigan, Bob Hoban, Eddie DeBruhl, Jackie Garrett, and David Humphreys. Produced by Neil Wilburn. Album art by Leo Pando. Vassar Clements has worked with Bill Monroe and the Blue Grass Boys, Jim and Jesse, Earl Scruggs, John Hartford, Norman Blake, Nitty Gritty Dirt Band, Jerry Garcia, and The Grateful Dead. 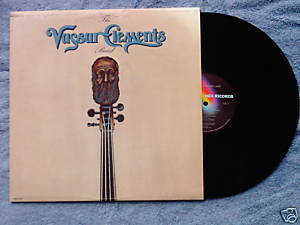 Vinyl is VG/VG; cover with illustrations and photos is VG with some ring and corner wear.